This outrageous musical comedy is lovingly ripped off from the film classic “Monty Python and the Holy Grail.” With a book by Eric Idle and music and lyrics by the Grammy Award-winning team of Mr. Idle and John Du Prez, Spamalot tells the tale of King Arthur and his Knights of the Round Table as they embark on their quest for the Holy Grail. 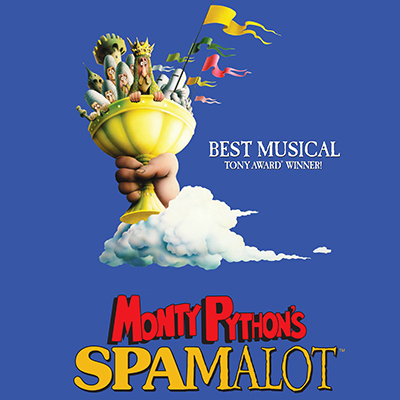 Flying cows, killer rabbits, taunting Frenchmen, and show-stopping musical numbers are just a few of the reasons audiences worldwide are eating up Spamalot! Join us at 6 p.m. for a pre-show lecture, presented in conjunction with the McGillicuddy Humanities Center. Sarah Harlan-Haughey, Associate Professor of English, will be the featured speaker. With a specialty in Medieval literature, Literature, and the Environment, Folklore and Oral Traditional Studies, the talk is sure to provide an enlightening backdrop to the play. Refreshments will be served. Subscribers receive 50% off all fees, deduct $3 from the ticket price.